2015 January | whydocatholicsdothat.com Blog– Pray. God is waiting. “…make yourselves little, humble, self giving, hopeful in relationship to others, keeping nothing back. And the more you empty yourself, the more God can work with you. Having read an article on our Holy Father’s position on Ecclesial elites and those who take an exclusive approach to faith, prompted me to reflect on this with the following. And to further the distinction by those practicing a faith in a myopic sense of self while maintaining the exclusivity and practice of ecclesial elitism, is shunned in Pope Francis’ plain and simple reminder to us of humanities own salvation history. Jesus’ words on loving and the unconditional inclusion of the other in all aspects and dimensions of love strengthens in our frailty God’s gifts of the theological virtues. Our Christian faith is a living faith and the very heart and foundation and definition of a unified people who approach communion which the God of Salvation History has given us in his new covenant, and renewed in his passion, death and resurrection. Therefore to be a Church in union with each other and with God comes together on the same altar of sacrifice which we all share! 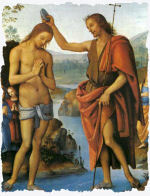 January 11, Feast of the Baptism of Christ Today we celebrate the baptism of Christ in the Jordan. This is the second epiphany, or manifestation, of the Lord. The past, the present, and the future are made manifest in this epiphany. The most holy one placed Himself among us, the unclean and sinners. The Son of God freely humbled Himself at the hand of the Baptist. By His baptism in the Jordan, Christ manifests His humility and dedicates Himself to the redemption of man. He takes upon Himself the sins of the whole world and buries them in the waters of the Jordan. — The Light of the World by Benedict Baur, O.S.B. January 10, Christmas Weekday Every country in the world has its own Christmas customs. Christmas in Australia is often very hot. Whereas the northern hemisphere is in the middle of winter, Australians are baking in summer heat. It is not unusual to have Christmas Day well into the mid 30 degrees Celsius, or near 100 degrees Fahrenheit. A traditional meal includes a turkey dinner, with ham, and pork. A flaming Christmas plum pudding is added for dessert. In the Australian gold rushes, Christmas puddings often contained a gold nugget. Today a small favor is baked inside. Whoever finds this knows that they will enjoy good luck. Another treat is Mince Pies. It is Father Christmas who brings the presents to the Australian children on Christmas Eve. Homes and gardens are decorated with greenery, Christmas tree and fairy lights. Seasonal plants are the Christmas bush and the Christmas bell. January 9, Christmas Weekday St. Francis initiated the beautiful practice of displaying a Christmas crib or creche. He built it in a cave on a bleak mountain near the village of Greccio. News of what he was doing spread all over the countryside and a steady stream of men, women and children came by night carrying torches and candles to light their way. 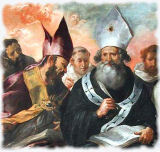 St. Raymond devoted much of his life to helping the poor. The famous incident which is recounted in the story of Raymond’s life took place when he went with King James to Majorca. The King dismissed Raymond’s request to return home. Relying on his faith and love of God, Raymond walked on the waves to his ship, spread his cloak to make a sail, made the sign of the cross then sailed to the distant harbor of Barcelona. January 5, St. John Neumann John Neumann was born in Bohemia on March 20, 1811. Since he had a great desire to dedicate himself to the American missions, he came to the United States as a cleric and was ordained in New York in 1836 by Bishop Dubois. In 1840, John Neumann entered the Congregation of the Most Holy Redeemer (Redemptorists). He labored in Ohio, Pennsylvania and Maryland. In 1852, he was consecrated bishop of Philadelphia. There he worked hard for the establishment of parish schools and for the erection of many parishes for the numerous immigrants. Bishop Neumann died on January 5, 1860; he was beatified in 1963. January 4, Solemnity of the Epiphany Epiphany is a large celebration, especially in Spanish speaking countries. Things look different around the household: the infant Jesus in the manger now has a small gold crown and is wearing regal robes. The figures of the wise men have reached Bethlehem, completing the nativity scene. The Church extends itself on Epiphany to the homes of the faithful. The custom of blessing the home on this day probably originated from these words in the Gospel, “And entering into the house, they found the Child with Mary, His Mother, and falling down they adored Him.” The priest blesses the house if he can be present, but if not, the father of the family may do so.